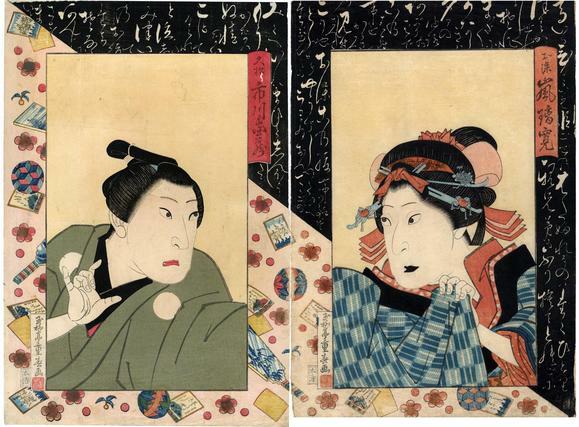 A diptych with bust portraits of the actors Arashi Rikan II on the right as Osome and Ichikawa Danzō V as Hisamatsu on the left in the role of Hisamatsu. A border of New Year's game cards, balls and battledore and shuttlecock and calligraphy. Unlike other kabuki themes the story of Osome and Hisamatsu is included in nearly all the volumes written about this form of theater. And the right-hand panel in black and white in 2) in 原色浮世絵大百科事典 (Genshoku Ukiyoe Daihyakka Jiten), vol. 9, p. 137. The left-hand panel is illustrated in color in the same volume on p. 107.